Have you noticed when people are stressed they tend to look toward the ground? I know I do it. Maybe I’m “odd” this way. But when I feel exhausted by my kids’ moods or trivial-but-annoying problems, I just tend to curl up like knotted ball of yarn. Most people smile where I live--mild climates are conducive to them--especially when people are walking their dogs, golfing, playing soccer, or simply talking to a neighbor. Sometimes, though, if we force ourselves to uncurl and look to the skies, we can find a little inspiration…it could be the clouds in their infinite number of shapes, birds, tall trees, or the sun rising over the top of a mountain, burning away a light morning fog. As the weather gets colder, I need to look up. Or I look for something new and different to write about, like a local event. 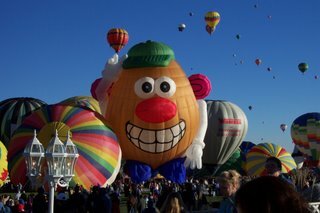 Every October in Albuquerque we have the Albuquerque International Balloon Fiesta. During this 9-day event, hot air balloons pepper the skies with rainbows of color, waving and smiling people, and the classic sounds of the propane burners. Hundreds of balloons rise to the occasion (pun intended). It’s simply an awesome sight. The only tough part is in trying to rise by 4:30am to beat the mad traffic, find parking, and secure a great cup of hot cocoa, funnel cakes, and a good seat before the Dawn Patrol goes up. They verify that the balloonists have the right conditions before the Mass Ascension. Anyway, when I need a spark, I write about the things that make me uncurl, open up, and think with a smile. Every city has something amazing, homey, or unique. What is your town or city known for that makes it different? What events do you look forward to every year? Have you written about these events? Let us know. It might spark a great new idea for a story, or remind you of an event that would be perfect for our current contest prompt. Thank you for the wonderful inspiration. You have awakened one of my fondest memories, that of the Albuquerque Balloon Fiesta. Shortly after I moved from Germany, a friend of my fathers invited us to be a part of his chase crew, we were up at 2 A.M. preparing for the long day. Chasing around in the truck looking up high in the sky waiting in anticipation for the balloon and its passengers to return safely to earth. After my husband and I moved back to the Albuquerque area with our own children, I shared the experience with them. We ventured to the grounds, wondered around with our heads peering towards the clouds and the balloons, hot cocoa, breakfast burritos, YUM! And the best of it all sharing my first experience with my children. Thanks for reminding me of a wonderful time in my life. You're welcome! I'm so glad you've experienced it, Carrie! Thanks for reminding me about the breakfast burritos! With green chiles, they can't be beat! Slurp. Associated Content: A Great Place To Start!